Manchester United regained the second spot in the Premier League after they completed a vintage comeback against Crystal Palace. The fixture, which ended with a scoreline of 2-3 in favour of the Red Devils, would be written in the history books as one of the high-intensity encounters that turned out to be a classic Premier League match. And though United came out on top, their below-par performance during the first half and for the opening minutes of the second half did not please manager Jose Mourinho, who did not hesitate to point out the mistakes in an emotional night at Selhurst Park. During the post-match interview, Mourinho said: “Remarkable comeback but with mistakes, fantastic comeback but mistakes. “I think the first goal is a bad goal. We started bad once more, not pressing the ball and not pressing the opposition and giving the opposition too much space. 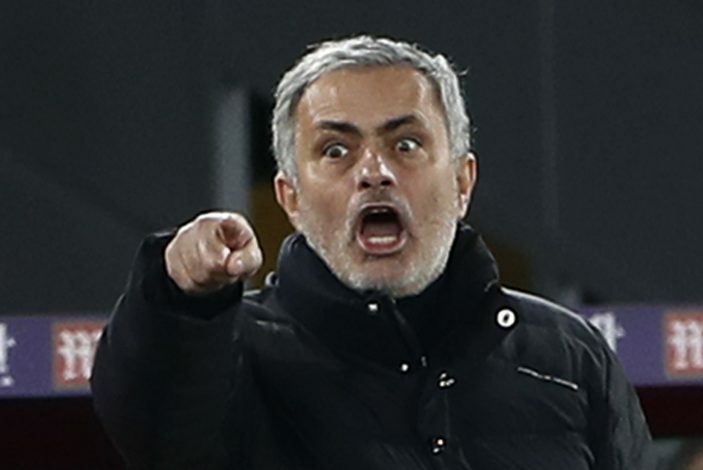 The Special One let his emotions overpower him in the second half, when he let his frustration out by kicking a bottle. But that wasn’t it, as when he kicked the ’empty’ bottle, it actually flew into the crowd, and the Portuguese’s instant reaction made it a hilarious one to remember. Just as the United boss kicked the bottle, he immediately put his hands on his head and apologised to the ever-so-vocal Palace faithful with an embarrassed smile on his face. “It was empty and it’s one thing when it is with the referee and another thing if it is the basic frustration of the game without any kind of aggression,” said Mourinho.